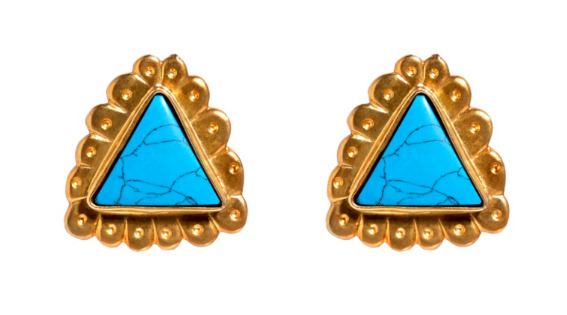 Mela Artisans’ gold and turquoise Cleopatra Earrings are fit for a queen! I love that they are completely handmade, as well as their slightly retro shape, bold color palette, and traditional elegance! After a life-long appreciation for the handcrafted goods and jewelry from India, father-daughter duo Navroze S. Mehta and Sonali Mehta Rao recognized a growing problem for indigenous artisans - the ability to market their products and sustain their livelihood. After reading one too many articles about artisans trading their time-honored skills for unskilled laborer jobs in large cities, Mela Artisans was created as a platform to connect these craftsman to the global market, as well as preserve the traditional methods necessary to create these handicrafts. In addition to this mission, Mela gives 1% of sales back to the artisans’ communities. This fund provides basic needs for these artisans to succeed as independent entrepreneurs, such as medical care for their families or solar energy for improved workshop lighting. Mela translates to ‘Festival’ in Hindi, and I couldn’t agree more - their products come together as a true festival of beautiful handmade goods! 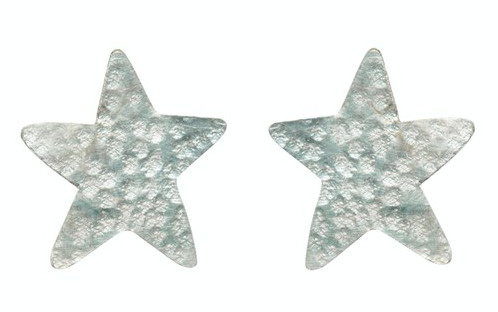 notablySmitten introduced Half United in August of this year...and now these Gold Bar Rae Earrings! Divine and delightful...they come in silver and rose gold as well. These Silver Infinity Hoops are deeee-lish. A perfect gift. Handcrafted in Rwanda. 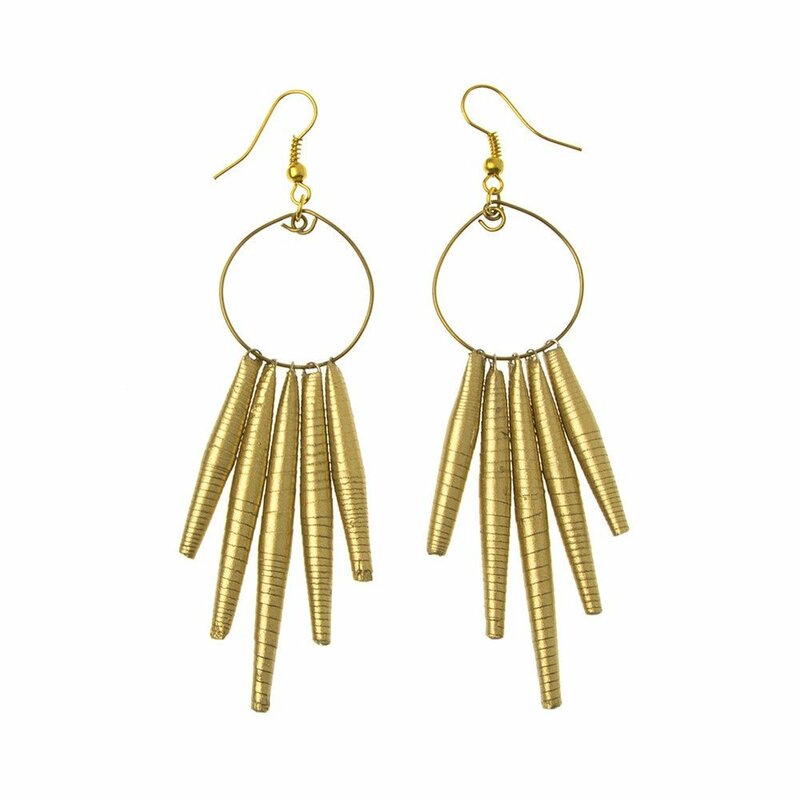 Each pair is finely crocheted with metallic plated seed beads on 24-karat hoops. Hoops measure 1.5” in diameter. Same Sky is working as a trade initiative to create employment opportunities for women in Rwanda struggling to lift their lives out of poverty. In 1994, nearly one million people were murdered in just 100 days during the genocide in Rwanda. A quarter of a million women were raped, and 70% contracted HIV/AIDS. These women were used as weapons of war, left as widows, single mothers and orphaned girls. Same Sky was born with a mission to help them. Transformation happens with the dignity of work and the freedom of being self-sufficient. Same Sky employs the artisans of Rwanda, giving them fair wages and further training and education necessary for them to live empowered lives. “Talent is everywhere, opportunity isn’t”— Same Sky aims to change that. A purchase of Infinity Hoop Earrings bonds you eternally with a woman a world away. 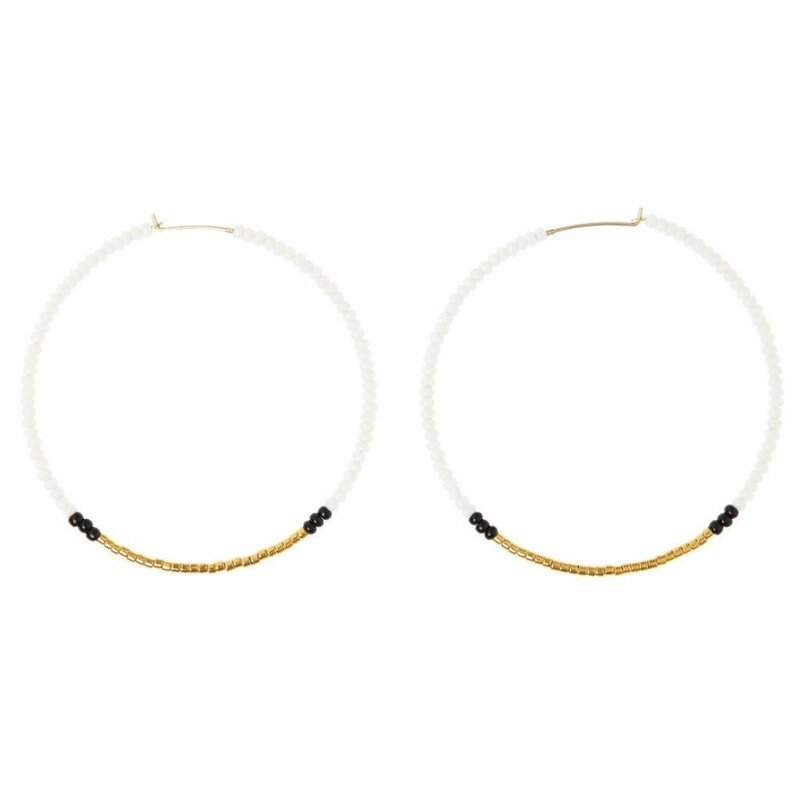 Infinity Hoops come in Silver and Gold. This vibrant, beautiful, multihued adornment is made out of paper. Yes...paper! Each and every bead is created using hand rolled paper. All jewelry at 31 Bits is hand crafted by women artisans living in Uganda. 31 Bits began five years ago, when 5 college friends, Kallie Dovel, Alli Swanson, Anna Toy, Brooke Hodges, and Jessie Simonson, with graduation just a year away, found their lives changing drastically. Kallie, had just returned from a trip to Uganda where she met and spent time with women that had grown up in war and had nothing. They were single moms with no education and no job prospects. What struck Kallie the most, the women were her age. The contrast of the lives the women were leading was stark. Kallie witnessed, that though the women had not had the opportunity of an education, they made up for that with amazing artistry and ingenuity - making unique, beauteous jewelry out of old posters. Miss Dovel brought a box of the jewelry back with her, when the rest of the friends fell in love with it, they all knew a business was emerging. A few of the girls went back the following summer and spent time with the women making jewelry and sharing life stories. Kallie stayed through the following year, setting up the organization. 31 Bits has also implemented a five-year holistic development program in Uganda, where each woman receives health education, finance training, counseling, and business training. They currently have 120 women in the program whose lives have been transformed. Through your purchase, you are helping to empower women rise above poverty with dignity and grace.